The President of India, Shri Pranab Mukherjee will administer the oath of Office to Shri K.V. Chowdary as Central Vigilance Commissioner and Shri Vijai Sharma as Chief Information Commissioner at a function to be held at Rashtrapati Bhavan tomorrow (June 10, 2015) at 1230 hrs. 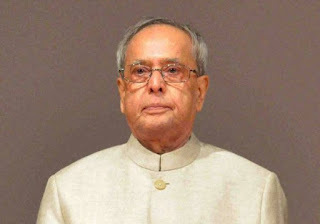 The President of India, Shri Pranab Mukherjee has extended his greetings and felicitations to the Government and people of Portugal on the eve of their National Day (June 10, 2015). In his message to His Excellency Prof. Anibal Cavaco Silva, the President of the Portuguese Republic, the President has said, “On behalf of the Government and people of India and on my own behalf, it gives me great pleasure to convey warm greetings and felicitations to you, the Government and the people of Portugal on the occasion of your National Day. India cherishes its warm and friendly relations with Portugal. Both our nations have a shared desire to further develop our political, economic and cultural ties to their full potential for mutual benefit of our peoples. I am confident that we can work together to build a stronger partnership between our two countries. Please accept, Excellency, my best wishes for your personal health and well being and for the continued progress and prosperity of the people of Portugal”. The Prime Minister, Shri Narendra Modi, was today briefed on the progress of various healthcare initiatives of the Union Government; and India's progress towards Millennium Development Goals. The Prime Minister said that an evaluation should be made on the contribution of Swachh Bharat Abhiyaan, towards improvement of health indicators. He called for documentation and adaptation of best practices in the healthcare sector across the country, to enable their rapid scaling up for maximum benefit. The Prime Minister noted that huge strides were being made in Human Development Index and social parameters, in areas where the Total Fertility Rate (TFR) has fallen significantly. He said that these benefits of low TFR should be brought before the people across the country. The Prime Minister asked the Health Ministry to keep an eye on acute health problems affecting specific parts of the country, such as Japanese Encephalitis in Eastern Uttar Pradesh and Bihar. He also said more attention was required on the healthcare initiatives for the urban poor. Minister for Health and Family Welfare, Shri J.P. Nadda, was present at the meeting. The Prime Minister, Shri Narendra Modi, today said that focus on water conservation should be an integral part of all water supply initiatives. Chairing a high-level meeting on the National Rural Drinking Water Programme, the Prime Minister also said that while planning for rural areas, a clear provision should be made for the water requirements of cattle and other related needs. It was observed that following the increase in devolution of funds to States in accordance with the recommendations of the Finance Commission, States could spend a portion of the additional funds available, for drinking water supply projects. Union Minister for Union Minister of Rural Development, Panchayati Raj, Sanitation and Drinking Water, Chaudhary Birender Singh was present at the meeting. The Prime Minister, Shri Narendra Modi, today reviewed the progress of the Swachh Vidyalaya Programme at a high level meeting comprising top officials from the Ministry of Human Resource Development, the NITI Aayog and the PMO. The Prime Minister had announced from the ramparts of the Red Fort during his Independence Day address last year, his Government’s intention to construct toilets in all schools within one year. The Prime Minister was informed about the current status of construction of toilets in schools across various states. Toilets are being constructed by States, PSUs, as well as some private sector entities. Based on the available data, the Prime Minister noted that several states are already close to achieving the hundred percent target. He directed concerned officials to focus on these states immediately, so that these states complete the task at the earliest. The Prime Minister has directed the Cabinet Secretary Shri Ajit Seth, and OSD in the Cabinet Secretariat Shri P.K. Sinha to personally review the figures being reported from various parts in the country, so that any bottlenecks in the full implementation of the vision of “Swachh Vidyalaya” initiative can be removed expeditiously. Observing specifically the gaps in implementation of the targets accepted by some PSUs and some private sector entities, the Prime Minister directed that these be looked into, so that these organizations can also meet their targets within the stipulated timeframe. Union Minister for Human Resource Development Smt. Smriti Irani was present at the meeting. A two member mission of the World Bank Group is visiting India to collect data and information for Doing Business Report, 2016. The members of the Mission are Ms. Nadine Abi-Chakra and Ms. Baria Nabil Daye. A kick start meeting was convened on 8th June, 2015 at 3:30 PM in Department of Economic Affairs (DEA), Ministry of Finance, North Block in chairmanship of Additional Secretary Shri Ajay Tyagi. The meeting was attended by the representative of DEA, the World Bank Group, Department of Industrial Policy and Promotion (DIPP), Ministry of Corporate Affairs (MCA) and Central Board of Direct Taxes (CBDT). 1. Requirement of minimum paid-up capital for companies removed. 2. Requirement of common seal for companies removed. 3. Requirement of filing declaration of commencement for companies removed. 4. Single step incorporation of companies through INC-29 Form. 5. Loans or guarantee to fully owned subsidiary company facilitated. 6. Process to approve related party transaction made simpler. 7. Board’s resolutions taken off the disclosure requirements facilitating better functioning of companies. 8. Order to facilitate revival and rehabilitation of MSMEs issued. 9. Customs Clearance Facilitation Committees (CCFCs) constituted at ports to facilitate expeditious clearance of goods. 10. Only three documents are required for exports and imports. The Mission appreciated the efforts made by the Government and promised to take note of initiatives taken by Government of India and State Government. The Government has reconstituted the Film & Television Institute of India (FTII), Pune Society in pursuance of Rule 3 of the Rules of the Institute for a period of three years. Shri Gajendra Chauhan has been nominated as the President of the FTII Society and Chairman of its Governing Council. (3) Shri Shashi Prakash Goyal, Joint Secretary, Department of Higher Education, Ministry of Human Resources Development.